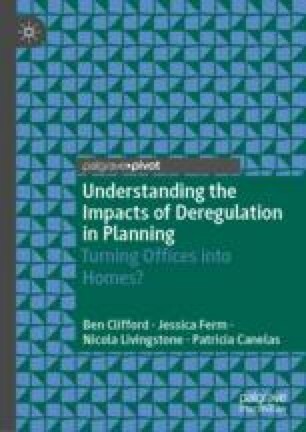 This chapter reviews previous studies on office-to-residential change of use, considering what is already known from existing research on the topic, whilst clearly explaining the need for the new research published in this book. This previous work looks largely at the rate of use of the relaxed rights, and the implications in terms of numbers of housing units delivered and the office market. They do not look in detail at the type and quality of housing delivered or implications for local authorities and communities (in terms of lost revenue and externalities). They tend to be desk-based studies, lacking the richness which comes from detailed case study examination. The way our work extends these is explained. Colin Buchanan and Partners. (2006). Infrastructure Deficit Study 2004–2021. Thurrock Borough Council. https://www.thurrock.gov.uk/sites/default/files/assets/documents/ldf_tech_infrastructure.pdf. Accessed 28 October 2017. Nathaniel Lichfield and Partners. (2009). Infrastructure and Environmental Capacity Appraisal (Final Report). St Edmundsbury Borough Council Forest Heath District Council. https://www.westsuffolk.gov.uk/planning/Planning_Policies/upload/web-IECA-Final-Report-July-2009.pdf. Accessed 28 January 2017. Nathaniel Lichfield and Partners. (2011). Departments to Apartments: Converting Office Buildings to Residential. http://lichfields.uk/media/2493/departments-to-apartments.pdf. Accessed 28 October 2017. RICS. (2015). Q3 2015: UK Commercial Property Market Survey. https://www.rics.org/Global/RICS%20UK%20Commercial%20Property%20Market%20Survey%20-%20Q3%202015.pdf. Accessed 26 January 2018. Roger Tym and Partners. (2010). Harlow Infrastructure Study, Stage 2 (Final Report). https://www.eastherts.gov.uk/media/29978/Harlow-Infrastructure-Study-2010/PDF/. Accessed 28 October 2017. Savills. (2015). Spotlight: The Future of Manchester. Savills World Research, UK Cross-Sector. http://pdf.euro.savills.co.uk/uk/residential—other/spotlight-the-future-of-manchester-december-2015.pdf. Accessed 28 October 2017. TBR. (2014). Office to Residential Permitted Development Rights Impact Study: For the London Borough of Camden. https://www.camden.gov.uk/ccm/cms-service/stream/asset/;jsessionid=C30B8D659E9D7985AF7ABD53E99FFE35?asset_id=3453726&. Accessed 22 October 2017. Young, F. (2014). Permitted Development Rights Fails to Deliver Homes as the Policy Deadline Approaches. http://residential.jll.co.uk/new-residential-thinking-home/news/permitted-development-rights-fails-to-deliver-homes-as-the-policy-deadline-approaches. Accessed 28 October 2017. Young, F. (2015). JLL Responds to the Permanent Extension of Permitted Development Rights. http://residential.jll.co.uk/new-residential-thinking-home/news/jll-responds-to-permanent-extension-of-pdr. Accessed 9 September 2017.